I can’t remember not being able to swim. I was lucky enough to start at an early age as a child growing up in London. My parents took me to the local pool, we had lessons at school, and once I was older my friends and I would go swimming for fun on weekends. Yet around the world, the lives of millions of children are in danger because they have not had such opportunities. Every other minute a child drowns. More than 40 people lose their lives to the water every hour of every day. Drowning is a silent epidemic claiming the lives of 360,000 people a year worldwide, according to the British Royal National Lifeboat Institute. The issue is particularly prevalent in Asia and the Pacific, where water shapes the land and its people. In Bangladesh, drowning is the leading cause of child mortality. It is responsible for nearly half of deaths of one to four-year-olds. Over 15,000 children needlessly lose their lives to the water in Bangladesh every single year. That’s an appalling figure, and one that led me to visit Bangladesh to see for myself what the country is doing to reduce the numbers. 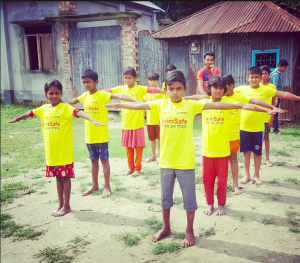 I had never thought of traveling to Bangladesh before, but I’m a trained swim teacher and passionate swimmer, and I wanted to pass on my skills. Bangladesh is a country with many open water hazards. Most villages will have at least one pond, there are rivers and ditches, and the sea. During monsoon season flooding can be a big issue. Several years ago, local NGO the Centre for Injury Prevention and Research began research why drowning figures are so high, and put a plan in place to reduce drowning deaths. 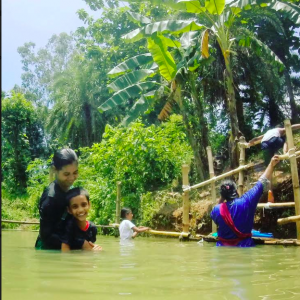 They discovered two key points: more than 80 percent of the drowning occurs in natural bodies of water (ditches, ponds, and canals) less than 20 meters from the house, and most drowning occurs in rural areas during the day between 9:00 a.m. and 2:00 p.m., when the mother is busy with housework or other chores and the child is left unsupervised. The CIPRB concluded it was most cost and time effective to teach older children to swim, and to keep younger children away from the water. The organization set up swim schemes across the country. I was able to assist with one such scheme at a place called Sreepur Village, which is run by a British charity. It’s located in Gazipur region, just north of the Bangladeshi capital Dhaka. The schemes are devised so they can be set up in any village pond–no need for a proper swimming pool. The children go through a warm up with their teachers, which includes jogging on the spot and some stretches. They then have their nails checked (so as not to scratch themselves or others in the water) before being divided into groups of around five or six. The swimming area is made out of bamboo and the water is around a meter or so deep, so it’s safe enough for even the shortest children. The more confident and older children are able to swim in an outer, deeper area, if supervised. Each group spends around 30 minutes in the water six times a week. At the end of two weeks, the majority of students are proficient enough to pass the three essential skill tests–swim 25 meters freestyle, tread water or float for 30 seconds, and perform a rescue from dry land. 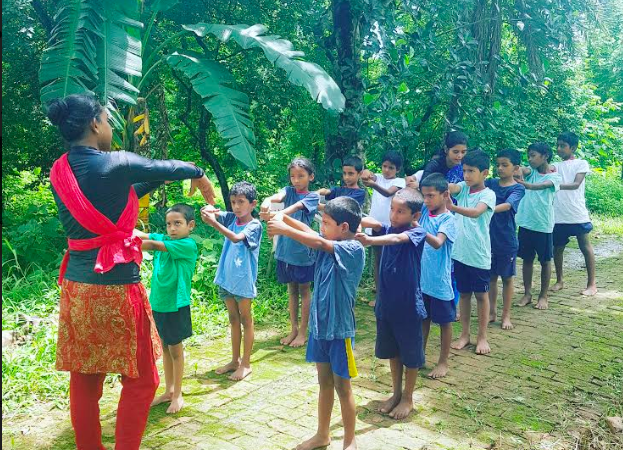 It would take far longer to teach three or four-year-olds such skills, so the CIPRB is setting up anchals–basically nurseries in many of the villages–where the toddlers can be kept away from the water. Their mothers can drop them off at the nursery at 9:00 a.m., and they stay there until 1:00 p.m., allowing their mothers time to complete chores without worrying about their children’s safety. The kids are able to play and sing songs and generally have fun in a safe environment. The CIPRB said they had faced some opposition when they first began introducing the anchals as it is against local tradition for young children to be educated away from their mothers. However, the benefits are slowly being recognized. 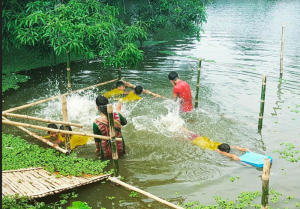 It is going to take a long while before drowning is no longer an issue in Bangladesh, but at a recent conference CIPRB Director Dr Amin Rahman said “people now believe drowning is preventable in Bangladesh,” so that’s a big step. The government is creating a National Drowning Prevention Plan and says it is committed to eradicating drowning as an issue, and on World Water Day this year the United Nations launched a new drowning prevention group. It looks like this silent epidemic is not so hidden from view anymore.